AFRICANGLOBE – Secret documents recently released reveal the full extent to which Britain systematically destroyed files relating to colonial crimes it committed in the final years of the British empire. Files published by Britain’s National Archives at Kew tell how administration staff in Kenya, Uganda and Malaya ‘cleansed’ so-called dirty documents. Material which could ‘embarrass Her Majesty’s Government’ was burnt, dumped in rivers or discreetly flown to Britain to stop it falling into the hands of post-independence regimes. Today’s declassified documents are the eighth and final batch of 8,800 files from 37 former colonies held in a secret Foreign Office archive at Hanslope Park, Buckinghamshire. They should have been made available to the public, but were kept hidden. 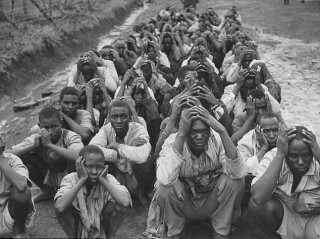 The existence of the archive only emerged last year, when a group of Kenyans who were detained and tortured during the Mau Mau rebellion in the 1950s sued the British government, which finally agreed to release the files. The latest batch contains scant detail of any atrocities committed – implying that the majority of the damning papers have been destroyed. Among them are thought to be records of the torture and murder of Mau Mau insurgents detained by British colonial authorities, the alleged massacre of 24 unarmed villagers in Malaya by soldiers of the Scots Guards in 1948 and sensitive documents kept by colonial authorities in Aden, where the army’s Intelligence Corps operated a secret torture centre in the 1960s. The destruction of this material was a huge undertaking, and in Uganda was codenamed Operation Legacy. The documents make reference to ‘clean’ and ‘dirty’ files – presumably a reference to the information included in them. Officials were told that ‘emphasis is placed upon destruction’, and no trace of either the documents or their incineration should remain. The files are available to the public from today in the reading rooms at The National Archives.